Just picture this – a boat that takes you along a jeweled stream that has some magical creatures floating below and stunning jewels that lie at the bottom of the bed. As you float along, you encounter sparkling cascades that drop down from stunning hills that are covered with green trees. Dotting the scene are twittering beauties and fluttering fairies. Further, you spot mysterious coves hidden between the ridges of the hills – Mesmerizing? You might think that this kind of land exists only in Fairy Tales. Hey! You are so wrong. I did visit one of these. Right here – in this life, in India. 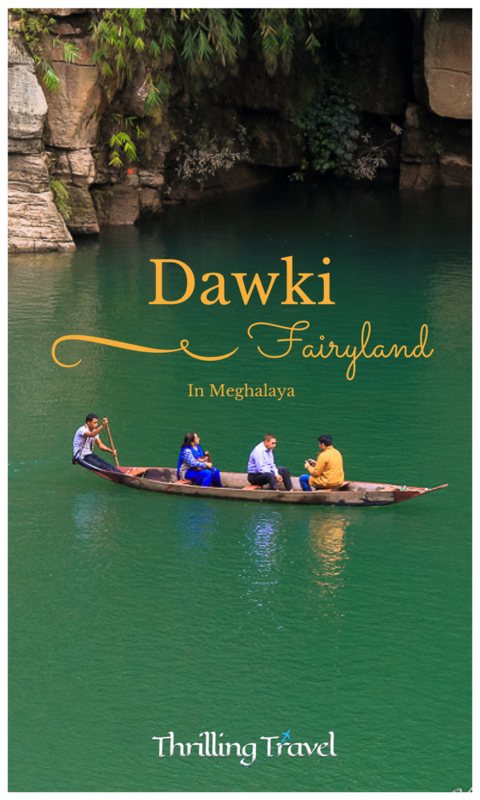 Welcome to the fairyland in Dawki, Meghalaya. 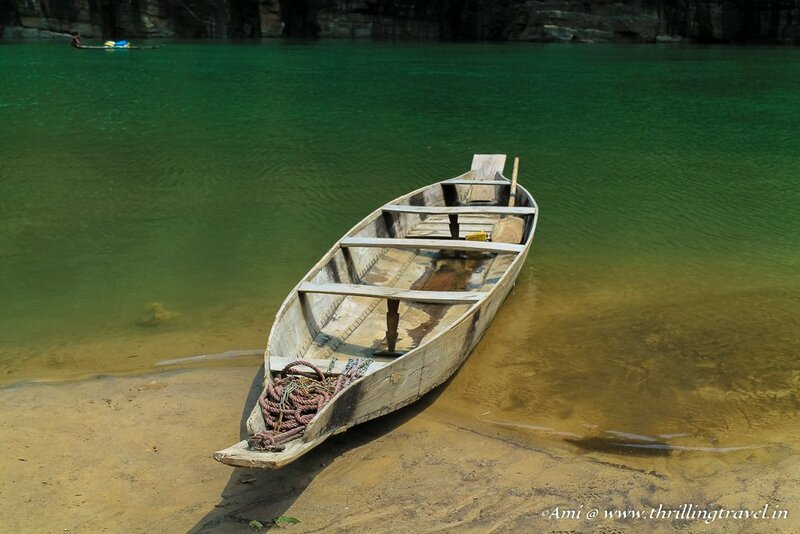 Dawki is a small border town along the India- Bangladesh Border in Meghalaya. The town is a hot spot for trade between the two nations but in reality, has a lovely fairyland enclosed within. Close to the cleanest village of Asia – Mawlynnong, I managed a magical visit to this place. The magic truly lies in the gorgeous river that flows out here. 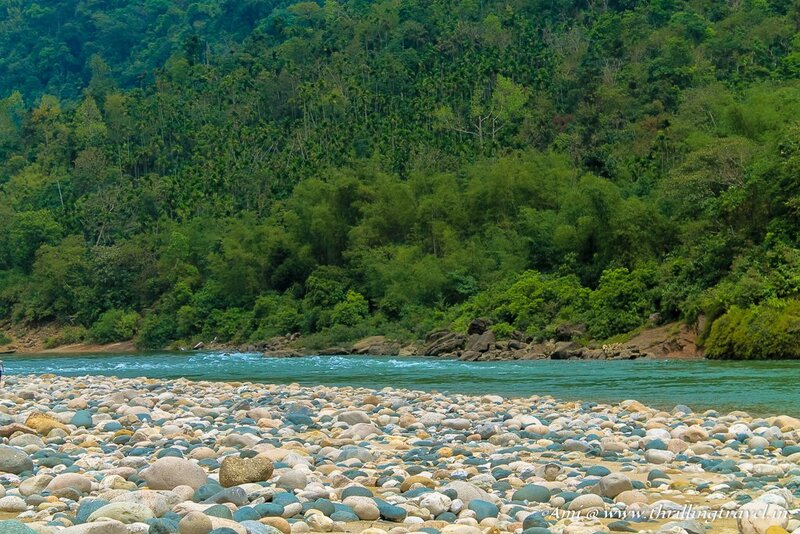 Popularly referred to as the Dawki river, its actual name is Umngot River. The river is where the fairyland lies. The Umngot River is considered as one of the cleanest rivers in India. One look at it and you will agree that it definitely is. Not just the cleanest but one stunning river. 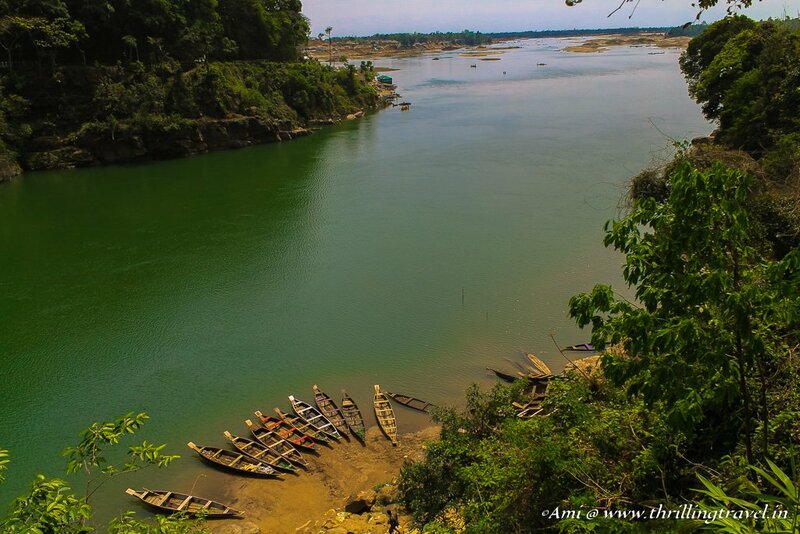 A natural divide between Jhantia and Khasi hills, this river flows into Bangladesh through Dawki. They say that on a good day, the water of Dawki river is so clear that the boats floating on it, look as if they are on a crystal glass surface. A lot of these pictures can be accessed on the internet. Having seen some of those, I really wanted to see this for myself. 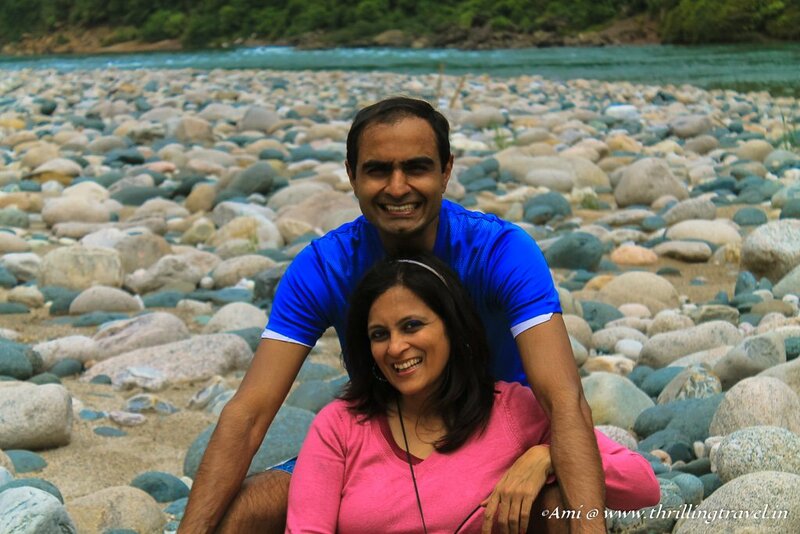 Sadly, it had been continuously raining when we planned a trip there and I did not see the river in its full glory. However, what I did see blew my mind! A little sad after leaving the beautiful village of Mawlynnong, we set out for our last destination in Meghalaya – the stunning Dawki river. I tried to think positive as the car set off along the winding roads that led to the border of India. The drive kept getting us closer and closer to the Bangladesh plains that I had first spotted from Mawlynnong village. The sight of the same had my little 11-year-old minx curious and she burst into a tirade of questions on how, why and what about Bangladesh. The only time she stopped was to gasp at the lovely waterfalls that lined our paths. The last one completely had her dumbstruck for it was this huge one that fell right beside the bridge we had to cross. With a quick photo op, we bundled back into the car to ride in silence for the next couple of minutes till we lay eyes on a curved emerald stream! Flowing between two hills was a clear emerald stream. Green yet clear, so far yet near. The Umngot river may not have been clear as I had seen in the internet pictures, but it sure was stunning. Even though you might have seen pictures, seeing something this beautiful in reality was just a different feeling. It really felt too good to be true. 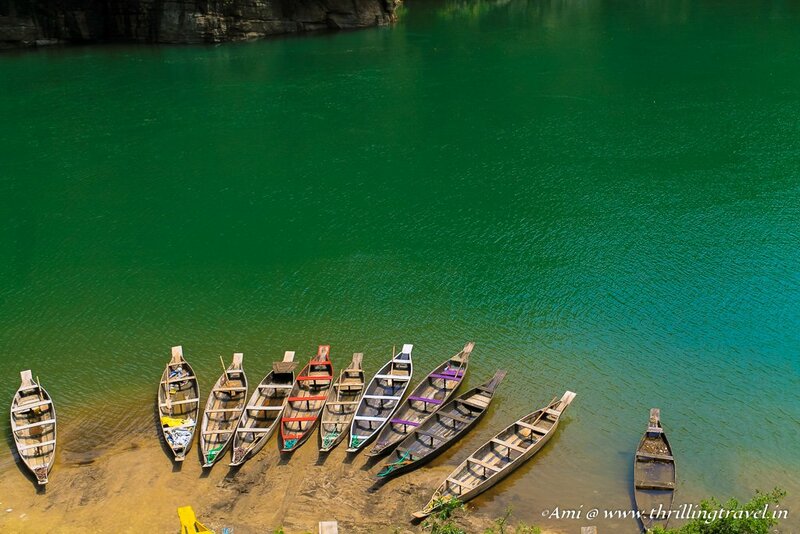 The green of the river shone under the sun and was only accentuated by the colorful boats that lined its shore. The only way I wanted to ensure that I was not dreaming was to rush down to the river and touch it! Yes, it was a reality. I was in Fairyland. The transparent, emerald stream was a path through a magical land. Eager to see it, we boarded the snake boat. The boatman perched himself at one corner, high above the emerald surface and pushed off towards paradise. It is funny how the shape of the boat and the position of the boatsman added to the magical fervor of the place. It was almost as if he was suspended above the jeweled surface of Dawki river. The first few movements had my daughter shriek but soon she got enveloped in the magic of Dawki. The river bed was strewn with deep round pebbles and stones. It was evident from the surface itself that they were colorful – possibly gemstones hidden away underwater. Around the glistening rivers, we spotted mysterious alcoves – the kinds that elves and fairies hide in. Green on the outside, with a curtain of a cascade, the moist walls of these tiny grooves shone back at us – almost beckoning us to come and explore. The only sounds of the valley were the gentle swishing of the river and the melodious calls of the birds. The boat ride took us to a small island which I fondly term as Sinbad’s Island. You might have heard of the legend of Roc in the famous One Thousand and One Nights, where Sinbad the sailor got trapped on the Island of these huge birds that had equally huge eggs. That is where he found the treasure that he carried back home. Well, looks like I landed on the same island full of Roc Eggs. Stunning, beautiful and unbelievable! The island was full of round pebbles that I had seen earlier in the Dawki riverbed. What made the whole scenario amazing was that they were of beautiful colors. I checked with the boat man on how did these land here. He said – They were always there! Now, if that is not magic, then I really do not know what is! After the Island visit, we completed a tour of the rest of the river. That brought us back to reality as we sailed below the famous Dawki bridge, constructed by the British in the 1930s. The suspension bridge can handle only one vehicle at a time. The cross-over leads to the official India border. Dawki river as it enters Bangladesh. Notice the gradual change of green to blue in the river. Reluctantly, I got back to reality and headed back to our car. Honestly speaking, for those few moments, I had forgotten that I was a girl from Bangalore, here on a trip with my family. I felt that we just belonged here. And even now, as I recount this experience, I feel as if I had dreamt it all. My pictures are the only proof of my visit there. Everything else does feel like a fairytale. However, after this visit, I do think Fairyland exist and that Fairy Tales are true! Dawki can be done as a day-trip from Shillong. On how to get to Shillong, refer to this post of mine. You can hire a taxi from Shillong that can take you here and bring you back. The best time to visit this place is from October to May. During Monsoons, the level of water is quite high and boating is suspended. The island too, gets submerged during monsoons. Combine a trip to Dawki with the Living Root Bridges of Mawlynnong. You can even visit Mawlynnong village as a part of this day trip. I would highly recommend a stay in Mawlynnong as it is a delightful experience in this cleanest village of Asia. A day trip does not really do justice to it. You can get in touch with North East Explorers or stay options here. There are no restaurants or restrooms close to Dawki, unless you head to Dawki village. The climb down to Dawki river can be steep for some – especially the aged. There are no uniform steps. The boat ride in Dawki can cost you anything between INR 500 to INR 750 per boat, depending on the season. When visiting the Indo-Bangladesh border, remember to stick to the rules of the BSF. Do not venture beyond the point indicated by them. Wow, it’s so tranquil! I love your pictures too, and thanks for the tips about monsoon season. Thank you Dannielle. Glad you liked the pics. Wonderful place. Truly beautiful pics. Gorgeous pics and a great post, Ami! 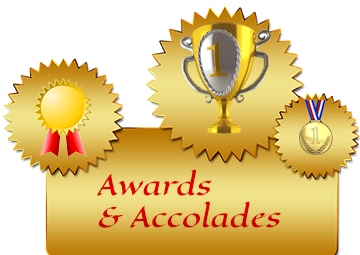 Your blog is simply amazing. I am going to bookmark this post for my reference as we are planning to visit Shillong sometime this year. and this will surely come in handy. Thank you Esha. Glad you liked this and the blog. Your compliments made my day. 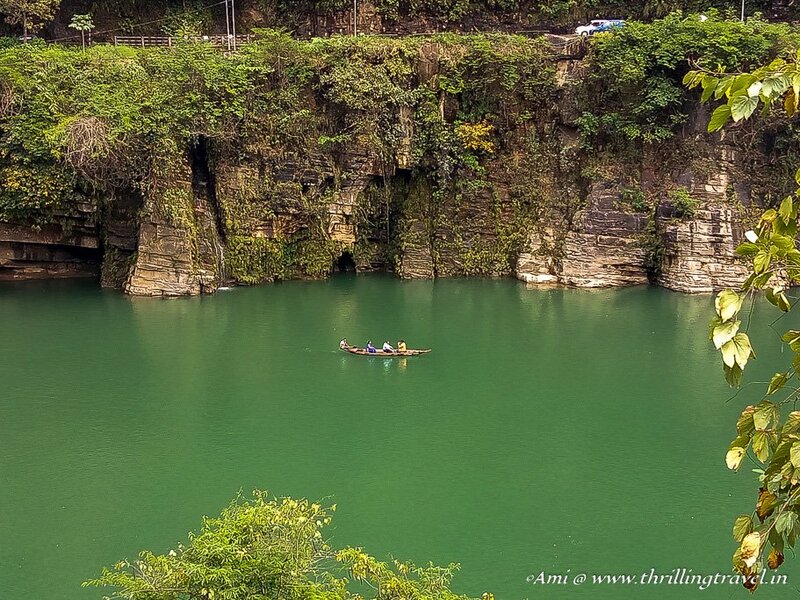 Stay tuned to it as I share more posts on Meghalaya that might be useful to you. Words can’t describe the beauty you have captured in this trip. Thanks so much for sharing your travels. I have visited Meghalaya, long before it was created, and your post makes me want to make this trip again. Never heard about this, its really wonderful. Very nicely captured. One of our secrets Jyotirmoy. Thanks for dropping by. India really is a land of many contrasts. This is not the typical scene when one thinks of India, but it sure is incredibly beautiful! Absolutely Tami. Most people think of the Taj or the Rajasthan palaces. At the most Goa and Kerala. There is so much more to India than these. And some of it is stunning. Thanks for stopping by. I have been hearing a lot about Dawki lately. It is an encouraging sign to see more and more travelers heading to North East India. Sindbad’s Island is so beautiful. I can spend a week here. I love borders and would love to see India- Bangladesh border. Sadly there is no way to stay on the island. And I believe it submerges in monsoon. 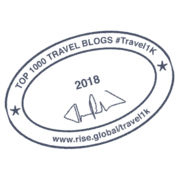 🙂 Guess you will either have to stay in Mawlynnong or Dawki of which the first one is amazing! Thanks Swati. This place is just amazing! Did both of them. You can start with Sikkim. Infact, best time for Sikkim would have been between Feb and April, because they have the International Flower Festival there. Worth attending..
Tawang, October, if you like ice skating.. But for a sunny weather, this is right time.. After August, it gets really rainy (with lots of leeches)….. Do not miss Nuranag, Sela and Jaswantgarh.. I spent 8 months serving there.. Spectacular..
You have a knack for capturing the beauty of the place without putting a word on the paper! 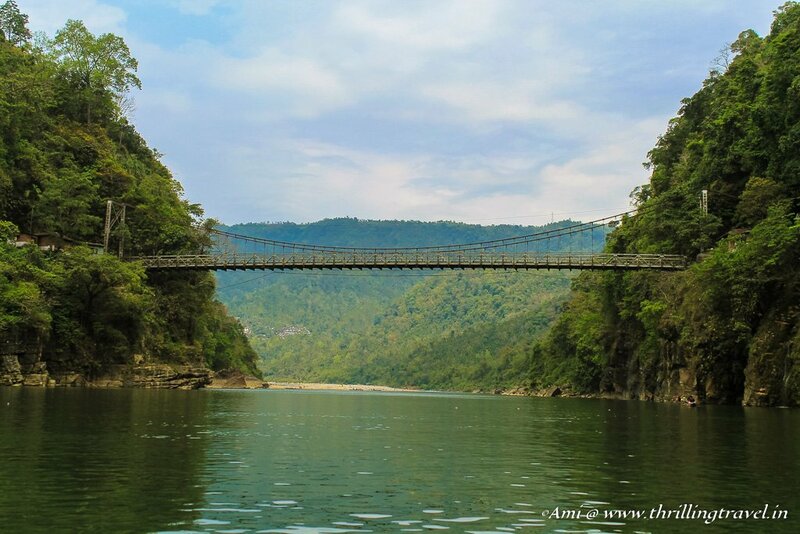 I had heard mainly about the Living Roots bridge in Meghalaya before this post! I’m glad to have known the place where Sinbad found his treasure. 🙂 Well, I should have said – Fantasize this. Thanks for the compliments on the pics. Frankly I don’t think they did justice to the place. This is a fairyland indeed. I’ve always dreamt of visiting a place like this. The pictures perfectly describe the beauty of this place. Thank you Mariyam. You will feel it even more fairy tale like when you are there. There are such a many cool places in this world and so less time to visit it! I love your pictures! The Dawki river is actually on my travel bucket list. I have heard so much about it, but I’m glad I got a preview of it here. It looks like an absolutely magical place. Hope to visit soon! Thanks Karie. Hoping that the pictures have made it climb higher on your list. Your photos are stunning. The lake is so beautiful. I could sit and watch for hours doing nothing. I also loved the colored boats it provides the right amount of contrast. Thanks Nisha. I wish that sometime in life if I ever go again, I get to see the clear water here. I looked at that first photo and it reminded me a lot of the limestone formations in a province that I just visited recently in my country, Qurino. It’s fascinating to see a similar view in another country. Even the pebbled riverbank is the same! This is so uncanny haha… River Dawki looks amazing. I want to go there. Intersting Marjorie. I shall look up the reference. Thanks for sharing it. Wow! It really looks like a magical place! Loved your photos. Which camera did you use? 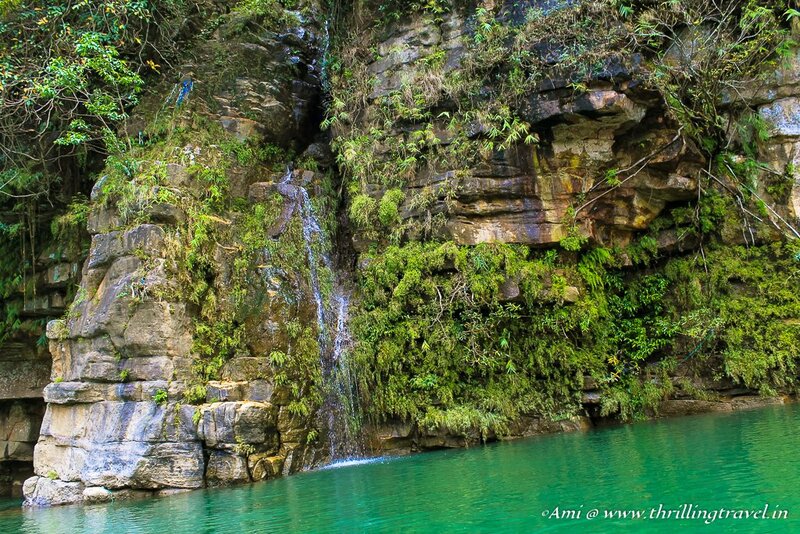 Meghalaya is on our bucket list! Sindbad’s island looks beautiful! Can’t believe the colours! Love your photography. Thank you . The place is magical indeed. Thank you Neha. It sure is a lovely isle. OMG! It is actually a fairyland so beautiful, clean and amazing. I should say i was so much lost in your post and pictures, that I forgot this is not in real and I am just seeing it through your post. Amazing pictures Ami. I surely need to visit living root bridge as well as Dawki River in Meghalaya. Thank you. I am not surprised your feel that way. I had to rub my eyes too. OMG! That’s definitely fairy land!!! The landscape is so unbelievable and surreal! The pebble-y land is just awesome. I’d love to walk barefoot on that! The aerial shot of those colorful boat is just awesome! Thank you Bhushavali. You are definitely going to love it when you get there. Gorgeous river, I didn’t know places like this existed in India! It looks so clean and the colour is so pretty! There are a lot of such hidden gems in India. You should definitely explore. You photography and description painted a beautiful picture of this amazing location! Great detail for me to leverage when planning a trip here! Thank you so much. I do hope you plan a trip there soon. What a lovely trip. 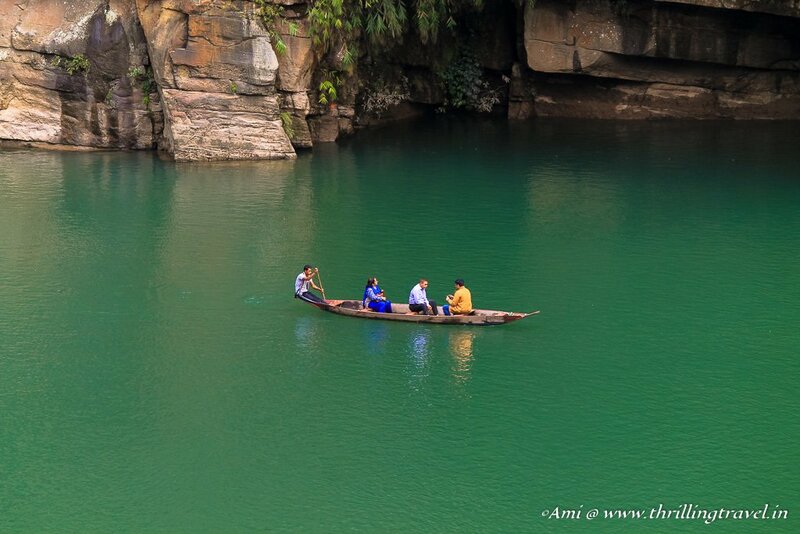 The Dawki river looks so ethereal as it shimmers in its emerald hues. I can see that the journey itself was as enchanting as the destination as you traveled across pristine landscapes. The ‘Sindbad Island”, looks really intriguing and the ‘small’ pebbles really look like eggs. Your pictures are seriously stunning. I have never heard of this place and now I want to go tomorrow!! I’m not sure what I loved more, the emerald water, the waterfalls or the pebble beach! Thank you for sharing this wonderful place with us!! Neither do I know what I loved the most. I think in general, this place charmed me. Thanks for stopping by. Wow! 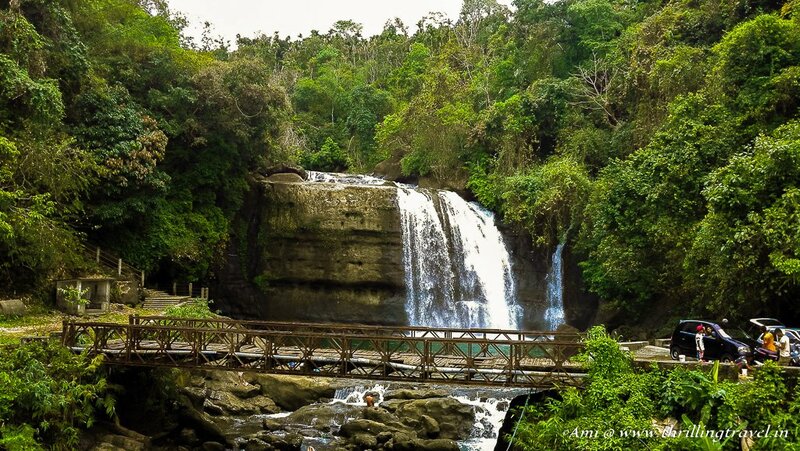 This place is similar to Quirino Province’s “Governor’s Rapids” here in the Philippines. I am just in awe of the rock formations and the contrast of the land from the water. There’s too many similarities between India and the Philippines, eh? I think so too. I had a similar observation on the two countries. Glad I was not the only one thinking that. Thanks for stopping by Aldrick. Wow, what unbelievable scenery. Great shots, I would love to visit Sindbad Island one day. Thank you Chris. I hope you get to it soon. Holy. I just wanna thank you for this post. I never thought there was something like in our country, i guess there are a lot of things unsearched! This is a very helpful post since one day I’m planning to do India to Bangladesh land crossing. This place is a very beautiful to do cross boarding. 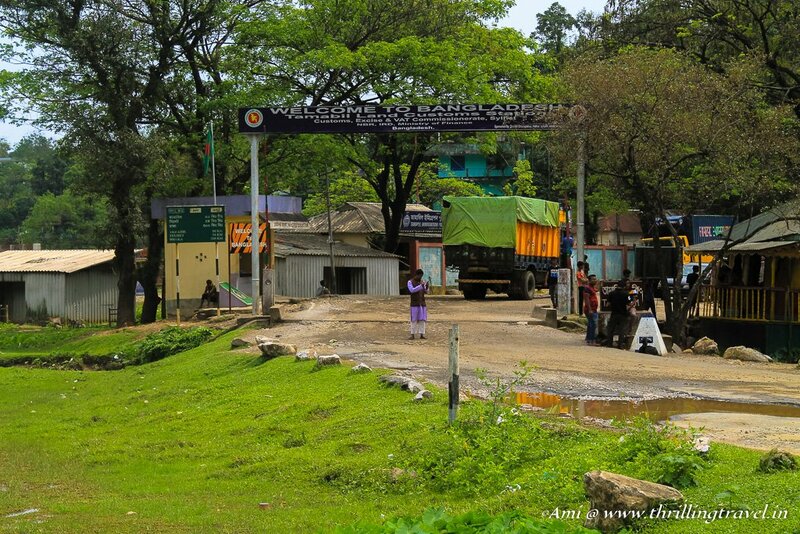 Do you have ideas if foreigners can cross the boarder going to Bangladesh from this point? How do you pronounce Dawki? Is it Da-va-kee? How do we reach this place? Which is the nearest railhead?Kindly update all of us with all these pieces of information. Such a refreshing post and brought by a current of nostalgia of my visit to Dawki long back! Of course your pictures bring out the beauty in a more subtle manner along with the written words. Thank you Rahul. Glad you liked the post. What a beautiful place. I kind of hope it never becomes too popular and gets spoiled!! The waters look so serene! Floating among the calm, emerald waters is my idea of a relaxing getaway. I’m sure the photos don’t do Umngot River justice enough! Thank you Shane. I agree with you. The real thing is even more beautiful. Wow, I didn’t know about this place before! It looks stunning! I would love to take a boat ride there. The waterfall looks lovely too. I agree, I tried to keep my expectations low too but it was just so enchanting. Glad we share the love. What a stunning place, I love the colour of the water! It also looks like you are in a middle of the nature with no disturbance which is lovely! I would love to visit someday if I get a chance. This looks to be a magical experience that literally walked out of a fairytale. I’m a sucker for water falls and color, which guaranteed your post drew me right in. Thank you Sara. 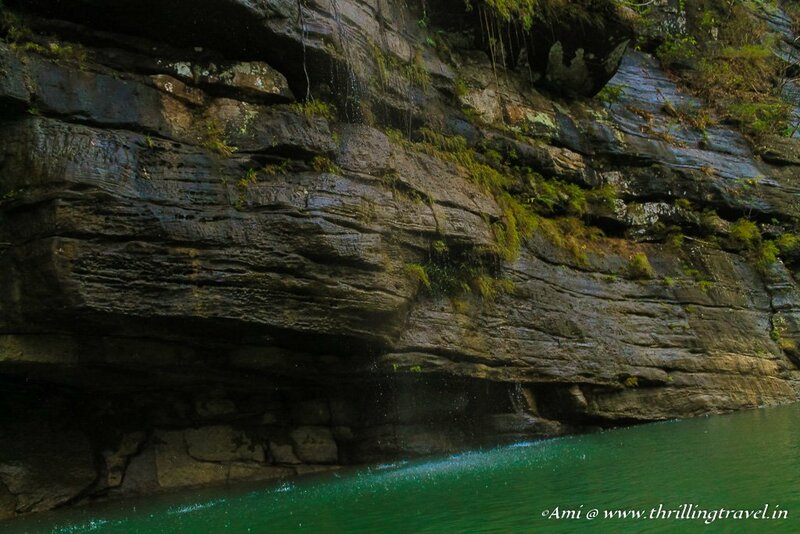 You are bound to love Meghalaya given that you love waterfalls. There are just tons of them. That rive really is beautiful! I’m a sucker for nature and the river and the waterfall is just up my street – you are right. Dawki is a true fairyland! Thank you Sam. Am pretty sure that since you love nature, you will fall in love with Dawki. Wow the photos are amazing! The river was absolutely stunning and the waterfall is so insane!! It really is just like a fairyland. Thank you so much. Happy that you also found this place nice. The Emerald river looks amazing! India seems to have so many beautiful landscapes that we should all explore. I would also love to see the India-Bangladesh border. There is just so much to see here. Even as a resident, I find it difficult to capture it all. Thanks for stopping by Eve. Can’t get over those green waters. The surroundings match with those colors giving a Serene and peaceful atmosphere. Pretty sure that you will fall in love with Dawki as I did. Hope you get there soon! What a great picture of you guys. This place looks a fairy tale for sure. I think that green shade of water makes it even more appealing, knowing how pristine the place is. 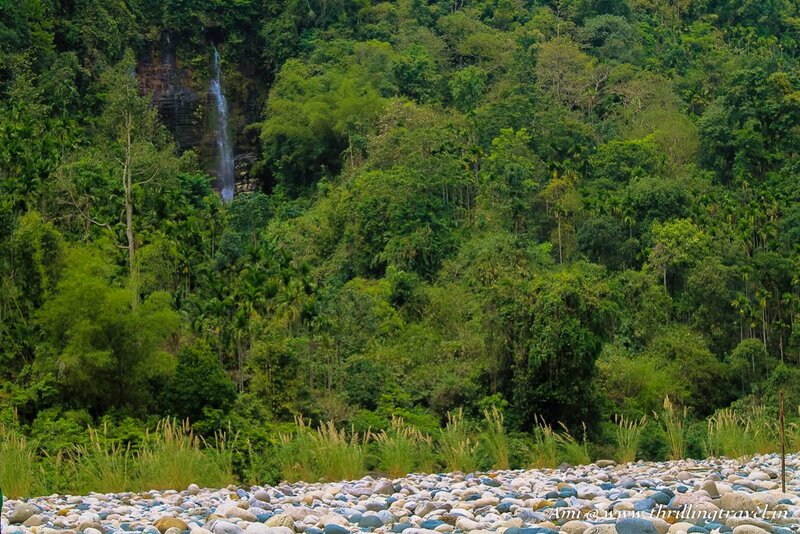 Ami, I love your pics of Umngot River! The colour is so beautiful and unreal! It must have been quite an experience to cruise along the river. It was a total fairy-tale like experience. It made me immensely proud to know that this is a part of my country and am glad that I found such a lovely gem. You should plan to get here. This blog is so beautifully written. I am glad that I read your content. Thank you. That is so flattering and motivating too. Hope to see you more often on my posts. Wow! That was an incredible article. You are my inspiration! I plan to visit Shillong and definitely Dawki next week. Sadly I just have a day to go out of Shillong. Can you tell me of how to cover Dawki and Mawlynnong in a single day? 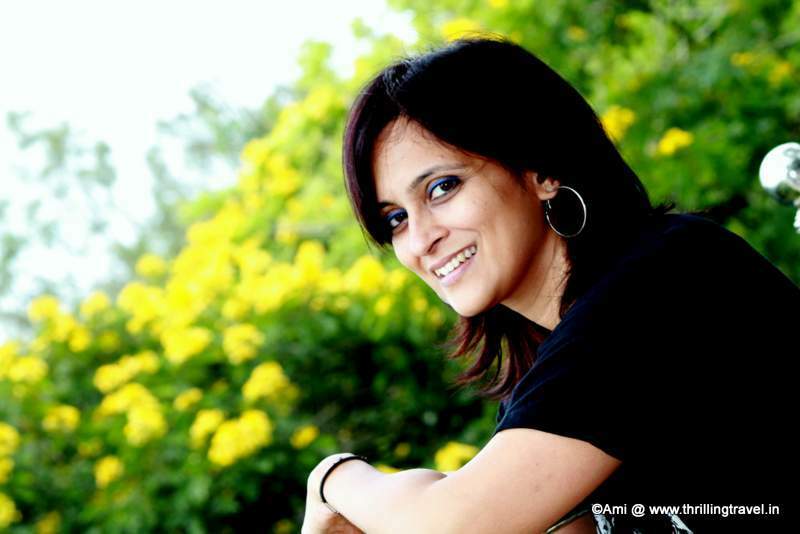 Thanks Varsha. Those are really encouraging words.